Lennie: "You said I was your cousin." George: "That was a lie. If I was a relative of yours I'd shoot myself." Lennie (John Malkovich) looms over his fellow workers with hulking size and exorbitant strength. In the fields, he performs the work of two men and hauls monstrous bundles with relative ease. However, this physical power contrasts sharply with his extremely limited mental capacity. Although he possesses a grown-up stature, Lennie displays the temperament and intelligence of a young child. When events do not occur to his liking, his tantrums of crying and whining match those of a boy. This contradiction leads him into unfortunate situations where innocents may face harm from his actions. 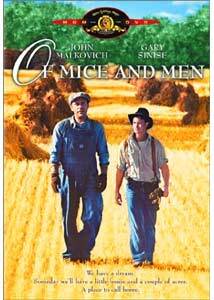 Of Mice and Men chronicles the plight of Lennie and George (Gary Sinise)�his benevolent protector in all facets of life. Based on the classic 1937 John Steinbeck novel, this saddening story follows their hopes and dreams while working daily in the fields. George appears to be an unlikely companion for Lennie and is intelligent and well-liked. With so much promise ahead, it's peculiar to see him teamed up with this man-child. Amid the majestic outdoor landscape, they strive to achieve the American dream of owning a tract of land one day. Gary Sinise also directed this emotional tale, and his eye wonderfully captures the atmosphere of this time and place. Kenneth MacMillan's bleached-out photography stirs the heart with an impressive view of the gorgeous, flat lands. Although Sinise keeps the camera movement to a minimum, he directs with a confidence usually reserved for more experienced directors. The strength of Horton Foote's masterful screenplay resides in the central characters, and the overuse of filming tricks would have lessened the overall effect. John Malkovich gives an eye-opening performance that differs considerably from anything else in his career. While his talent has generally been evident, this role allows him to create an entirely new character of troubling simpleness. While Lennie is usually likeable, he is also tortorous due to his limited understanding of life. Sinise excels in playing the everyman, and this is one of his finest depictions. George displays abundant humanity in his care for Lennie, but he also hides past demons that explain his actions. Sherilyn Fenn (Twin Peaks) nicely plays the frustrated wife of Curley (Casey Siemaszko, Limbo)�the landowner's son. Because of her submissive role, we never even receive her actual name. Curley makes her life miserable, and the men define her solely by her relationship to the bully. Lennie nearly forgets everything that occurs around him, but one of George's tales sticks inside his brain. Once they have saved enough money, Goerge plans to purchase a nice home where they can hire their own workers, and Lennie will take care of the rabbits. This is the primary goal in this feeble man's life, and everything that happens relates directly to this aim. Of Mice and Men succeeds by pulling us directly into these dreams and making them real. It is difficult to believe in this fable, but we still want it to come true. Malkovich and Sinise impressively develop an intriguing relationship between these understandable beings. When they fall, our own desires seem less likely as a result. Image Transfer Review: Of Mice and Men features stunning outdoor scenery that wonderfully conveys the atmosphere of work in the fields. This 1.85:1 anamorphic widescreen transfer does an excellent job in presenting the variety of bright colors in the picturesque landscape. The black levels are extremely solid, and only a few minor glitches appear throughout the film. Even the dark indoor scenes appear clear and avoid the grain-stricken picture that often overtakes DVD releases. This attractive transfer makes this disc worthwhile and helps to bring Gary Sinise's vision to its full glory. Audio Transfer Review: Mark Isham's touching score embodies the hope and sadness of this story with plenty of emotion and power. This 2.0-channel Dolby Surround track conveys these sounds impressively and helps to carry the story. This transfer contains a nice collection of ambient sounds that emanate from the natural world. However, the depth is fairly limited in scope due to the nature of the format. The dialogue and action spring clearly from the front speakers, and the overall presentation works strongly and effectively. Extras Review: Unfortunately, the lone extra feature on this disc is the original theatrical trailer. It comes in a 1.85:1 widescreen transfer that includes some grain but looks fairly decent. I would have enjoyed a commentary track from Gary Sinise or at least a documentary with cast interviews. Instead, MGM has decided to release it with nothing to supplement the intriguing story. Of Mice and Men brings the heart-wrenching words of John Steinbeck to life through an impressive script and a collection of in-depth acting performances. Within the pristine countryside, the intimate trials and tribulations of Lenny and George come to life and effectively draw us into their struggles.